Mr Hugh Catchpole was born on 26 May, 1907, at Ipswich, a small town of a pretty rural county, Suffolk in England. He did his Masters in History from Oxford University. Before starting his career as a teacher he did some flying in the civil and played cricket for the Suffolk County Eleven. His enviable career in education spanned seven decades in the Subcontinent. He joined Prince of Wales' Royal Indian Military College, Dehra Dun (now Rashtriya Indian Military College (RIMC) in 1928 as an Assistant Master and went on to become the Principal on 01 October, 1948. He stayed back at RIMC even after independence till his contract expired in 1954. The first Pakistani Air Chief, Air Marshal Asghar Khan and his successor Air Marshal Nur Khan had been his students at RIMC. They requested him to come to Pakistan and become the founder Principal of Cadet College Hasan Abdal. He was still at Hasan Abdal when Air Marshal Asghar Khan handpicked him to join PAF Public School Sarghoda as Principal, in 1958. He stayed there till 1967 and then joined Abbottabad Public School as Head of English Department, a post he held till his very last. He died at the age of 90, on 01 February, 1997, at Combined Military Hospital, Rawalpindi. His funeral service held at Christ Church of Pakistan, Rawalpindi was attended by Rimcollians, Abdalians, Sargodhians, and Abbotonians, whose lives he had touched and profoundly transformed. His body was taken for burial to Cadet College Hasan Abdal in accordance to his will. When his body was being lowered into the grave, three buglers of the Pakistan Army sounded the Last Post. Mr Catchpole was buried with such honours as would be the envy of many. Besides being an extraordinary educationist, Mr Catchpole was a humanist and philanthropist, who remained a bachelor throughout his life and financed many students' education with his scholarship funds in England, India and Pakistan. In his will he wished to donate all balances of his account to the institutions he had been associated with. Accordingly, all his life savings amounting to more than Rs.8 millions were distributed among Ipswich School, Suffolk, UK, Rashtriya Indian Military College Dehra Dun, Cadet College Hasan Abdal, PAF Public School Sargodha, and Abbottabad Public Schoo. Just 02 months before he died, he had to inaugurate a guest house named after him at Rashtriya Indian Military College, Dehra Dun. He had given a generous endowment of Rs.1.5 million for the guest house and planned to shift there after retiring from Abbotabad Public School. However, life did not allow him to do so. Mr Hugh Catchpole was honoured twice by Her Majesty the Queen Elizabeth the Second (full name Elizabeth Alexandra Mary) of the United Kingdom. On 01 January, 1971, he was awarded the Order of the British Empire (OBE). The British High Commissioner in Pakistan Sir Mac Rae did the honours. On 31 December, 1980, the Queen awarded him Commander's Badge of the Order of the British Empire (CBE) also called the Most Excellent Order of the British Empire. On 22 July, 1981, Mr Hugh Catchpole went to Buckingham Palace to receive it personally from Her Majesty the Queen. His niece Helen Catchpole and her son Richard Dodwell accompanied him. On 23 March, 1979, the President of Pakistan General Muhammad Zia-ul-Haq conferred upon Mr Catchpole the award of "Sitara-i-Imtiaz" for his meritorious services in the field of education. Lieutenant General Fazle Haq (Late), his student from RIMC who was then Martial Law Administrator (Governor) NWFP (now Khyber Pakhtonkhwa) did the honours in an investiture ceremony held at Abbotabad Public School. 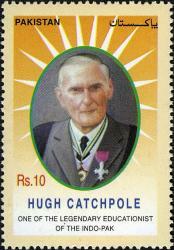 The year 2007 marked the birth centenary of the legendary British teacher Mr Hugh Catchpole. On 26 May, 2007, Pakistan Post Office issued a commemorative stamp showing Mr Catchpole wearing "Sitara-i-Imtiaz" and "Commander's Badge of the Order of the British Empire". Same day a documentary "The Life and Times of Hugh Catchpole" directed and produced by Mr Mohammad Shafiq Sultan was also aired by the Pakistan Television. The documentary traced the life of Mr Catchpole through the words and memories of his students. Mr Wayne Christopher Hignett the then Principal PAF Public School Sargodha played Mr Catchpole in the documentary. Four-day centenary celebrations were also held at Cadet College, Hasan Abdal from 11 to 14 June 2007. His student from PAF Public School Sargodha, Chairman Joint Chiefs of Staff Committee General Ehsan-ul-Haq inaugurated the celebrations. On the occasion, a marble bust of Catchpole was unveiled; and a coffee table book "Hugh Catchpole of the Subcontinent"; written by his student from RIMC Commander (Retd) Arun Prakash Bhattacharya was released. 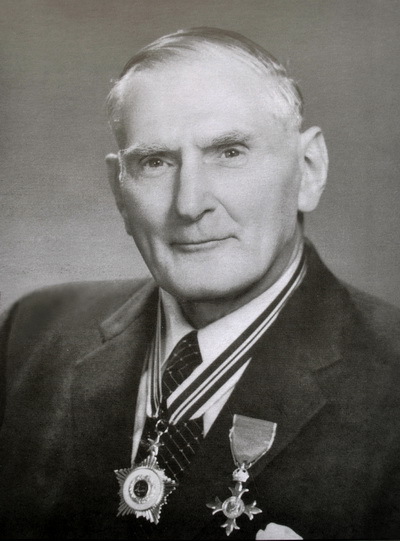 Hugh Cathpole's greatest contribution to the subcontinent is his students who went on to become high achievers in their respective professions. His students are spread across three nations: Pakistan, Bangladesh and India. Together they take pride in calling themselves "Catchpolians". The list of his old students reads like who's who of the defence forces of their countries.In Pakistan his students from PAF Public School Sargodha include: General Ehsan ul Haq, Chairman Joint Chiefs of Staff Committee (2004 - 2007), General Ahsan Saleem Hyat, Vice Chief of Army Staff (2004 - 2007), and two Air Chiefs, Air Chief Marshals Kaleem Saadat (18 March 2003 - 18 March 2006) and Tanvir Mahmood Ahmed (18 March 2006 - 18 March 2009. In Bangladesh too General Moeen Uddin Ahmed, Chief of Army Staff (15 June 2005 - 15 June 2009) and three Air Chiefs: Air Vice Marshals Sultan Mehmood (23 July 1982 - 22 July 1987), Rafiqul Islam (04 June 2001 - 07 April 2002) and Fakhrul Azam (08 April 2002 - 07 April 2007) had been his students at PAF Public School Sargodha.